0 Members and 1 Guest are viewing this topic. Read 1159 times. On the plus side - the sound is generally more laid back with a deeper soundstage. On the minus side - sacrifice precision and detail. The above could be said comparing 2 solid state pieces or 2 tube pieces or the observations could be reversed depending upon the pieces compared. I have experienced tube equipment with a lot of precision and detail. I began building tube preamps and amplifiers in the monaural days with partridge transformers and caps of any kind I could buy. (I also built my own speakers, using JBL and Tannoy drivers.) I kept building my own during the advent of stereo, but using Heathkits and Dynakits, plus a Scott for my last one. Then I switched to Macintosh. Tube quality became an issue, and when I could no longer get quality KT88s without having to buy multiples to get matched pairs, I quit tubes and went solid state. Truly, It Was A Jolt, but I survived, and now I'm very happy with my excellent Bryston gear. IMO, my current preamps, amplifier and spinner makes the sound of my former tube equipment a fond memory. And, looking at the initial costs - - and subsequent upkeep - - of the top quality high current tube preamps and amplifiers makes me happy that I switched those years ago. Just the thoughts of an Old Fud. I can partially answer this question. I own Bryston gear, and a couple of additional tube preamps. The main feature of tubes is second harmonic distortion. 2nd harmonic is good, folks like it. Anytime you think your sound is a little 'dry, plopping in some 2nd harmonic can cure it. The thing is, as the years since tubes were invented, and solid state gear arose.. Tube gear has been working to be more like solid state, and SS has become more 'liquid'. So at this point in time, whatever you are looking for can be had with either one. It is pretty easy to warm up sound with SS gear anyway. If you work at it a little. The cubed Bryston are already nice and liquid. not tubes needed. As an aside, I would add the more conditioning and AC work you have going the more liquid your SS gear can become. The main downside for me in particular of tubes is tube life. Since I am now retired, and l play music at home at least ten hours a day, every day,.. Take a new Audio Research Reference 6 preamp. recommended 2000 hours on 6550WE tube, and 4000 hours on the (7) 6H30P. For me, that is less then six months to 2000, and under 13 months to 4000hrs listening. I have been retired nine years now. that is at LEAST 15 of the one tube, and another 7 SETS of the rest... In the same time my Bryston B-26 had needed... nothing. sounds WONDERFUL. True for 12AX7/12AU7 tube based preamp tubes..
Added: a lot of tube hype is romance. They glow, they are 'interesting'. You can search high and low for old, 'special' tubes. Nostalgia... Romance. what is not to like. Added tubes also help with some mediocre digital sound. Tubes can alter the HF enough to hide digital glare. Elizabeth’s comments in this thread are right on the money. Literally. Once you have heard good tube gear in a well sorted system you will never forget it. The only Tubes i have in my set up are in my Hagerman Trumpet phono stage. It use 4x 12ax7 and 4 x 12au7 tubes. It came with electroharminix and modern Mullard’s which I quickly replaced with pre1956 Mullards in all positions. Close to $2000 to do that. But these are long lived tubes thankfully. I also have almost a complete set of a Amperex of the same vintage and some RCA black plates just for variety. Interestingly, a friend who has all VAC gear thinks my Bryston 28 Squared sound like a really fine tube amp! After they have been run for 24 hours they becomes exceptionally smooth and liquid. And just a bit o’ honey. No solid state amp sounds "just like a tube amp". While designers try to get them to sound as similar as possible, they will never quite get there. I would argue that McIntosh solid state amps are about as close to sounding like a tube amp available, mostly due to the autoformer. I own two higher powered tube amps, and they definitely do not sound the same as a solid state amp. There is a difference with the midrange that is easy to pick up. Ask any guitarist about this issue. They will tell you that their solid state emulation does not sound like their tube amp. Serious tube heads often eschew modern tube gear and go the kit/DIY route. Contrary to what some folks think, if one uses tried and true/proven circuitry, the performance from this gear can easily exceed commercial gear. This is because one can use higher quality parts than what is usually used in commercial gear, point to point wiring vice PCB's, and employ circuitry that uses high quality NOS tubes that are fine audio tubes, but not initially intended/designed for audio. Many commercial tube products use the 6DJ8, which was NOT intended for audio. It is a frame grid tube, used for IF stages. IMHO, the 6DJ8 is not a good audio tube. David Manley of VTL fame also hated that tube. If DIY scares one off, another option is to get a vintage tube amp restored by a reputable outfit. Hard to go wrong with a Harmon Kardon Citation II. Once I hear every solid state amp and every tube amp that’s out there, taking into account the permutations of preamps and cables, i’ll Get back to you. I have first hand experience with DIY. Hagerman used to sell half kits of his Cornet series phono preamps. For your money you got a pc board a parts list and directions. And the link to his forum here on AC. If memory serves, there was400 vac at one point on circuit and Plate voltage was 365 dc give or take 10 volts so one needed to be careful when checking voltages on first power up. The Cornet2 punches way above its class and served me well for many years. But I finally decided it was now or never for his Trumpet and sold it. Again NOS Tubes took it several levels higher than possible with modern glass. Oh, and the best wiring is no wiring. Bryston and Hagerman went to great design pains to eliminate wires and rely on gas free connections. Rest assured that one does not need to hear all the various equipment to work out that tube amps do sound different from solid state amps. Also, the guitarists I worked with (who are also engineers by trade) were always asking me to find them NOS 12AX7's for their guitar amp units. DIY is definitely a fun way to get into and enjoy audio. Some of the best audio gear from the golden era was available in kit form (Dyna, Harmon-Kardon). Here is a picture of the underside of 1625 tube amps I occasionally use. These sound very good, and have all higher quality parts than one finds in today's commercially made tube gear. Have tried tubes a few times with little success. Usually my experience is that they make little difference from solid state (a preamp and popular DAC that could switch the tube in and out, even tried recommended after market tubes). Owned a very well regarded tube integrated that with the right output tubes sounded better than old class D mono-blocks, but not worth the hassle of tube ownership. Also worry about deterioration of sound quality during their lives. Did hear an outstanding example of tube magic at home with an integrated amp on loan, but it had serious issues even after being shipped directly from the factory after repairs and it was a bit under powered for my speakers. The majority of the "tube sound" comes from the output stage to the speakers. Just sticking a tube or two in the playback chain may not make much of a difference. A lot of tube amps are under 60 watts, so the speakers need to be of sufficient efficiency to support the lower power. The tube amps I have are higher power pentode designs that can drive the speakers correctly. Tube gear can be reliable, as long as one keeps track of the power tubes. Case in point: I had a Fisher KX200 that was restored, which worked very well without issues for the time I had it. Sold it to a friend some years ago, and he uses it almost daily, and it still has the same tubes in it. In my experience, the larger the transformer, the softer the sound. Small SET amps with small transformers have much more detail. OTL amps have the most detail. But it has been awhile since I owned any tube amps with the larger transformers, so that might have changed. At heart, I am a tube guy and there is something about tubes that I find addictive. For me, tubes have "tone and texture" that makes voices and instruments sound more like the real thing. Tubes seem to provide greater sound staging, especially perceived depth, than solid state. Also, I just love looking at them, especially in a darkened room, where they add atmosphere. That being said, they will eventually need to be replaced. Output tubes will need more frequent replacement than input tubes. The type of circuit used will also determine how long tubes will last. Some designs stress the tubes more with higher voltages. Audible Illusions preamps had a rep for "eating" tubes. By changing tubes, one can change the sound of the equipment to fit your tastes. With solid state, you are locked in, however it is more forgiving of varying speaker impedance loads. "The whole tube or solid-state dilemma is somewhat of a misnomer. Once you accept the reality that a tube amp and a solid-state amp are very different in how they operate, you’ll perhaps better understand that each have their own traits. The biggest difference between them is that a solid-state amp is driven by current throughout the output devices and a tube is driven by voltage. Voltage alone can’t drive a speaker, hence the reason for needing output transformers. You’ll notice most stereo tube amps have 3 large, heavy objects, typically at the rear. They are a power transformer and two output transformers (one for each channel) that convert the voltage from the output tubes to current at the speaker posts. 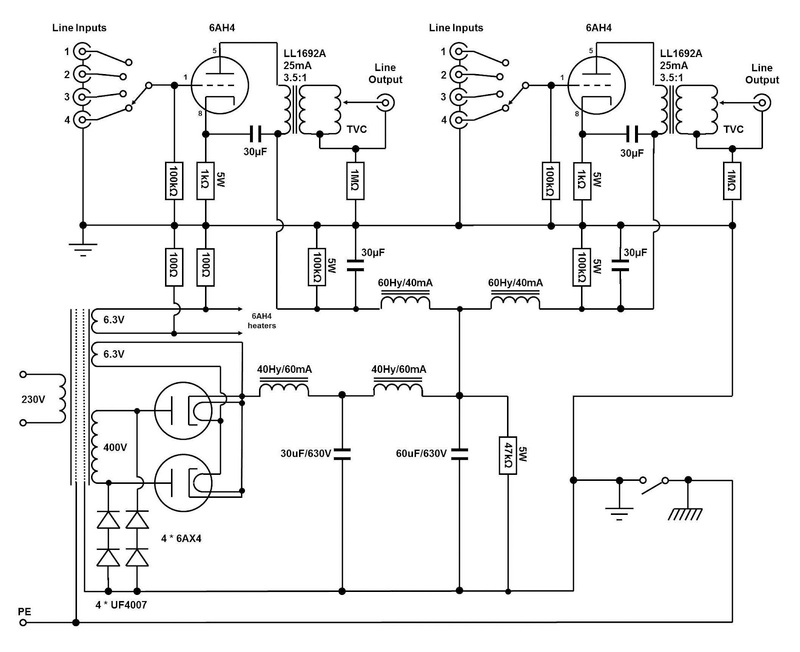 A solid-state amp typically has a single power transformer and no output transformers. However, a solid-state output transistor and a tube basically do the same thing. One doing it in silicone with current and the other doing it in a glass vacuum with voltage. Do they sound different? Yes, we believe so. However, some tube companies make their tube amps sound more solid-state like (for power) and some solid-state products can sound very tube-like. A key difference is that a tube product will require a small amount of upkeep and maintenance. For most who desire the benefit of tubes, it’s a small price to pay. Others just don’t want to maintain an amp once installed. Back to the sound. First, let’s squelch the myth that tube amps don’t have strong or controlled bass. Today, that couldn’t be further from the truth. Let’s also put to bed that solid-state amps aren’t smooth. Like any product from any manufacturer, all products have a voicing and color which is why you buy any given product. There are benefits and drawbacks to each, but one must weigh each depending on what you are looking to achieve in your audio system both in terms of sonics and upkeep as well as taking the rest of the system into consideration. So, in doing so, what are the benefits of each? Generally speaking, tubes offer a greater sense of bloom, more texture and realism to vocals and instruments, a richer midrange. Solid-state usually offers more watts per dollar, faster sound, greater detail. Once again these are generalizations. If you have a system that overall is a bit harsh or fatiguing, chances are you could greatly benefit from a tube amp. On the other hand, if your system is flat, sluggish, or too soft sounding, perhaps a quality solid-state amp is the way to go. Other factors of particular importance are speaker load. Some speakers (although few today) require lots of power and very low impedance driving capabilities. In that scenario, a solid-state amp may do better. But, if your speakers have a moderate impedance curve and are of average efficiency, a tube amp can redefine your definition of what a great audio system can sound like." This is not my experience. Listen to a restored HK Citation II, and you will hear outstanding, detailed music with a deep soundstage. Although I'm not a fan of current production tubes, the re-issue GL KT88 is a notable exception. My buddy has made some 200 watt KT88 amps that are incredible sounding, and have great detail without the SS hardness when the sound level is pushed. Offerings from VTL also provide good sound at higher power. SET transformers are actually larger as a power ratio to push/pull transformers. Also, low powered SET systems, while they sound great in the mid-range (which is important), do not reproduce low bass correctly, and are challenged at the frequency extremes. Still, I get the fact that for some audiophiles, that is what is most important to them, and that is fine. RPM123,m I like your post. Captures the thought rather well. My amps use NOS power tubes (1625, a 12 V version of the 807), and the 8552 (a 12 V version of the 6146B). They run with 525 Volts on the 1625 plates, and 600 Volts on the 8552 plates. The tubes last several years between replacements, as the bias is set well within specs of the tube, and here's the best part: The replacement tubes are not expensive at all. The 1625 amps put out 110 watts of clean pentode power, per channel and the 8552 amps put out between 80 and 90 watts (pentode) per channel. Here again, I think the McIntosh SS amps sound different to other SS amps largely due to the autoformer, which I have come to appreciate the merits of it's use in the amp. The benefits of the autoformer outweigh the drawbacks, which are largely weight and cost. They really do improve the performance of those amps, especially the current production models, all of which use balanced topology from input to output. SET is the ONLY way to go for power to speakers, assuming you have relatively high-efficiency speakers. One caveat is that the iron or output transformers must be good quality. There are a few designers in Asia/Japan that have this down. A misconception about tube electronics is that all it needs is a good power supply and not power decoupling. This is what sets apart tube amps that sound "tubey" and ones that sound like SS, only better. Tubes can also affect this, so picking very linear fast tubes with wide bandwidth is important. Unfortunately, most tubes that qualify are NOS and tend to be expensive and rare. Decoupling caps are often ignored in tube preamp and amp designs because of the higher voltages and lower currents. IT's a mistake IME. I have modded tube equipment in the past and adding these caps to the power subsystem always makes a big difference. If this is done right, telling the difference between good SS and good tube equipment is harder, although the inherent linearity and lower signal voltage swing usually makes tubes superior for analog. IMHO, disagree about SET being only way to go, unless you don't care about the frequency extremes in sound reproduction. Stu Hegeman, one of the gurus of tube audio, actually supported high powered pentode amps. David Manley also supported higher powered tube amps. Besides, the vast majority of speakers do not support a SET design. Even the speakers that do support SET are lacking in deep bass. Mostly concur with your other observations. Your points about NOS tubes is why I selected tubes that meet the wide bandwidth qualification and were reasonably priced (6AH4, 6BL7, 1625, 8552). Audio is mostly science, but there is just enough art involved to debate endlessly as to what is perceived as better. And that is part of the fun of this hobby. I have no issues with frequency extremes, in fact my current 35W per channel SET drives my speakers lower and with more authority than my previous 800W per channel modded JC-1 monoblocks. The Vapor Nimbus has no problem going really low. With the Russian NOS military tubes in my input stage, I get excellent HF speed, better than the SS JC-1's and I get more of a 3-D presentation with smoother vocals. No negatives. You only need to select the right speakers and amps, and optimally roll the tubes. Nice speakers! Would love to hear them with your amp. At 35 watts, your SET is pretty high powered for that topology. Most SET's I was thinking of are much lower powered. What amp do you use? I've always had an interest in higher powered SET's. Can you post some information about your amp? Would like to know more about it. At first blush, it's kind of hard to believe a 35 watt amp would work better than a 800 watt amp. The damping factor for the SS amp would be much higher, which should make the speaker behave better in the bass regions. Can you post some information about your amp? The amp looks very interesting. Good specs for a SET amp as well. I totally agreed with you on this. I think there's a misconception about SET amps in general. A well designed SET amps especially higher wattage one with robust power supply and well made output transformer should have no problem producing deep bass and extended high. Of course you'll need a right pair of speaker to go with SET amp, preferably one with higher sensitivity and more importantly easy load. A well made SET and speakers for SET are not cheap and this is the problem with people who want to get into SET. If they get cheap SET amps with wrong speakers for it of course that combo will sound awful. But when things come together correctly. The sound can beautiful. For example, acoustic stand up bass sound more natural to me through a great SET system with great nuance, body and decay. Anyway, SET system is not for everyone. For me this work perfectly in my small room, listening level and the type of musics I usually listen to. Oh! Wait... I'm talking about SET on Bryston circle? It's all a matter of what sounds best to you. Different tube equipment sounds different. I've used several tube preamps and buffers. I do think some of them sound good, but in the end I prefer good quality SS. Tubes have a "sound"; I like it, but in my opinion/experience they also have disadvantages: they add a bit of background noise that good SS doesn't have, and for my taste don't sound as "clean" in playback as good SS. That's my taste, and I prefer the totally quiet background and clean sound of good SS. People who prefer tubes have a different reaction t hearing the same thing. There is no right answer. You just have to try it and see what you like. Agree with your summary that one should find out what you like. I'm using a Thomas Mayer 6AH4 clone preamp that has ben quieter than most high end SS preamps I've owned over the years. It has a LOT of filtering in the power supply, and the transformer coupled output works incredibly well.